John Fitzgerald "Jack" Kennedy (May 29, 1917 " November 22, 1963), often referred to by his initials JFK, was the 35th President of the United States, serving from 1961 until his death in 1963. After military service as commander of Motor Torpedo Boats PT-109 and PT-59 during World War II in the South Pacific, Kennedy represented Massachusetts' 11th congressional district in the U.S. House of Representatives from 1947 to 1953 as a Democrat. Thereafter, he served in the U.S. Senate from 1953 until 1960. Kennedy defeated Vice President and Republican candidate Richard Nixon in the 1960 U.S. presidential election. At 43 years of age, he was the youngest to have been elected to the office,.}} the second-youngest president (after Theodore Roosevelt), and the first person born in the 20th century to serve as president. A Catholic, Kennedy was the only non-Protestant president, and was the only president to have won a Pulitzer Prize. 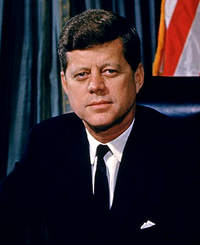 Events during his presidency included the Bay of Pigs Invasion, the Cuban Missile Crisis, the building of the Berlin Wall, the Space Race, the African-American Civil Rights Movement, and early stages of the Vietnam War. Therein, Kennedy increased the number of military advisers, special operation forces, and helicopters in an effort to curb the spread of communism in South East Asia. The Kennedy administration adopted the policy of the Strategic Hamlet Program which was implemented by the South Vietnamese government. It involved certain forced relocation, village internment, and segregation of rural South Vietnamese from northern and southern communist insurgents. This webpage uses material from the Wikipedia article "John_F._Kennedy" and is licensed under the GNU Free Documentation License. Reality TV World is not responsible for any errors or omissions the Wikipedia article may contain.